Geographic Reach of the US Event Industry! Home » Blog » Event Promotion » Geographic Reach of the US Event Industry! If you are new in event industry and planning to organize an event for your business then you have to understand one crucial factor which will decide the success of your event; i.e. the importance of location to your overall event. In this blog we will share and discuss some stats which will help you to understand the geographic reach of US event industry. There are around 49,000 event presenters throughout the United States, but the overwhelming majority of promoters have a limited geographic reach. Event presenters are mostly target cities and states that have high population, so that they can target maximum fans for their events. As a result, the distribution of event presenters is similar to that of the US population. However, there are uneven number of event presenters located in large, cosmopolitan and tourist-friendly cities, such as New York, Los Angeles, San Francisco and Chicago. These cities have wealthy and well-educated people along with renowned performance venues, such as Madison Square Garden, the Hollywood Bowl and the various theaters on and off Broadway. Because of the absorption in these cities, the Southeast, Mid-Atlantic, West and Great Lakes regions generate a larger share of industry revenue than other regions. The four regions account for an estimated 72.9% of industry establishments. 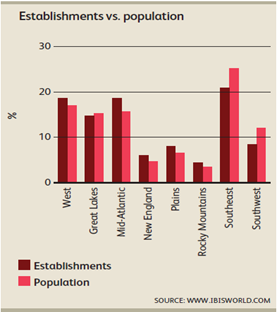 On the other hand, the New England and Rocky Mountain regions have the minimum share of establishments compared to other regions, a result of the highly rural nature of many of the states in these regions. These regions tend to have highly dispersed populations, which discourage the organization of events due to difficulties with profitability. Now, by analyzing the above stats and report you can definitely understand that the Southeast, Mid-Atlantic, West and Great Lakes regions are the most profitable region for any event presenter, but here you have to understand one point, that the regions definitely have good potential but they also have many existing big event presenters, so if you want to compete with these big existing event presenters, then you have to not only think differently but also have to act smartly by offering something extraordinary that can help you to attract your fans. Like ticket without any extra fees, no ticketing fee, no ticket print fee and no convenience fee. You must be wondering how it is possible to offer ticket without any extra ticketing fee, so the answer is Yapsody – online event ticketing system! We at Yapsody love our fans and don’t believe in unfairly taxing them for being entertained. Sign Up today with Yapsody and offer your fans a new experience of fee FREE ticketing!